This computationally derived homology model of glutamine transporter shows small molecule inhibitor binding in the transporter’s orange-red transmembrane region. Their findings, reported in this week in Nature Medicine, lay the groundwork for development of potential “paradigm-shifting” therapies targeting cancer cell metabolism that could be monitored non-invasively by positron-emission tomography (PET) imaging. Glutamine is an essential amino acid for many cell functions including biosynthesis, cell signaling and protection against oxidative damage. Because cancer cells divide more rapidly than do normal cells, they need more glutamine. 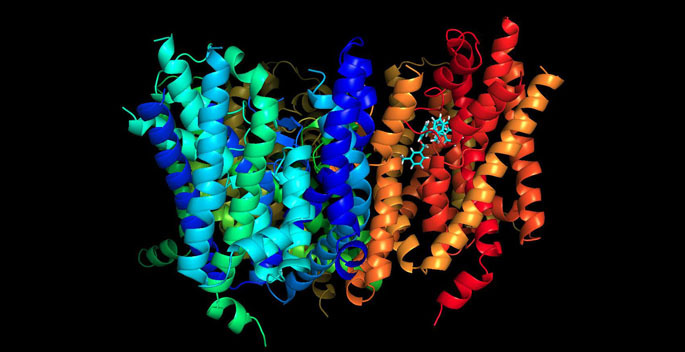 A protein called ACST2 is the primary transporter of glutamine into cancer cells. Elevated ASCT2 levels have been linked to poor survival in many human cancers, including those of the lung, breast and colon. Genetic studies that silence the ACST2 gene in cancer cells have produced dramatic anti-tumor effects. The Vanderbilt researchers went one step further: they developed V-9302, the first highly-potent small molecule inhibitor of a glutamine transporter. In cancer cells grown in vitro and in mouse models, pharmacological blockade of ACST2 with V-9302 resulted in reduced cancer cell growth and proliferation, increased oxidative damage and increased cell death. Targeting glutamine metabolism at the transporter level thus represents “a potentially viable approach in precision cancer medicine,” the researchers concluded. However, “pairing patients with glutamine-dependent tumors and this novel class of inhibitors will require validated biomarkers,” they cautioned. That’s because response to V-9302 depends more on the activity of the ACST2 transporter than on expression of the transporter gene. Fortunately, innovative PET tracers can be developed to detect tumors by their increased rate of glutamine metabolism compared to normal surrounding tissue. Currently five clinical trials are underway at VUMC to test the diagnostic potential of a new PET tracer called 18F-FSPG to visualize tumors of the lung, liver, ovary and colon. Manning and his CMP colleagues have also brought other tracers of glutamine metabolism, including 11C-Glutamine, into clinical trials at Vanderbilt. By attaching an imaging isotope to V-9302, Manning’s group also can see if the compound is reaching its target — tumors with high rates of glutamine metabolism. The Vanderbilt-Ingram Cancer Center is funding the development of what Manning calls this “theranostic” approach — the combination of therapeutics and diagnostics. Manning is the Ingram Professor of Cancer Research and professor of Radiology and Radiological Sciences, Neurological Surgery, Biomedical Engineering and Chemistry in the Schools of Medicine and Engineering and the College of Arts and Sciences. 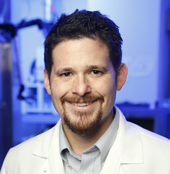 The paper’s first author is Michael Schulte, PhD, research instructor in Radiology and Radiological Sciences. Other Vanderbilt faculty members who contributed were Jumpei Kondo, PhD, Robert Coffey, MD, Jeffrey Rathmell, PhD, Melissa Skala, PhD, Jarrod Smith, PhD, Jordan Berlin, MD, Kay Washington, MD, PhD, and Michael Nickels, PhD. The study was supported in part by National Institutes of Health grants CA068485, CA095103, CA197570 and DK058404, by the Kleberg Foundation and by a Vanderbilt University Trans-institutional Programs (TIPs) award to the Center for Molecular Probes.